Between our last appointment and this I feared everyday that went past. Every time I went to the toilet I would panic that something might be wrong, and do what I call the wipe and breathe. Although apprehensive, we were crazy excited. It was the first time we were able to see something that looked like actual babies, and hopefully have a photo to take home and show our family. For our 12 week scan we went to the QEII hospital in Welwyn. Gavin picked me up from work, and by this point I'd learnt to have a stash of nappy sacks in my handbag to vomit in. The sickness started around 5am, then continued whilst I bathed before work (yes it floated), on the way to work (nappy sack between my legs), in the carpark (I think you get the idea), and then all the way through until I went to sleep at night. Of course I was sick numerous times on the journey there, and then I was having to try to put back the water I was sicking up so my bladder would be full. Then we went through for our scan. There they were again... Those 2 perfect heartbeats. Another phew moment for another few weeks! The midwife and sonographer were so stunned by their energy already. They were kicking each other, and had everyone in stitches. They also made us slightly further gone than initially thought (a VERY pleasant surprise). We were 13 weeks and 5 days. The boys kicked each other throughout the scan. 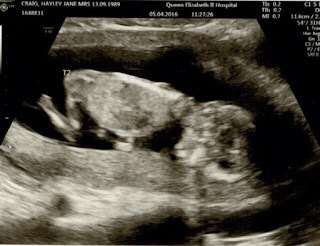 Baby below even has his fists up!